The British Studies Institute invites you to attend the conference "Roundabout Leipzig" focusing on Leipzig in the English speaking culture. The conference takes place on May 22nd, 2009 and the program starts at 9 AM in the lecture hall of the university library "Albertina." The conference was organized on the occasion of the University's 600th anniversary. For more details, please check out the attached flyer. The American Studies Alumni Association invites you to attend the first in a series of ASAA Brownbag Luncheons to discuss and explore career opportunities with alumni who have been in your shoes. Alumni stop by for a lunchbreak at their Alma Mater to talk about how they launched their career after graduating from American Studies Leipzig. 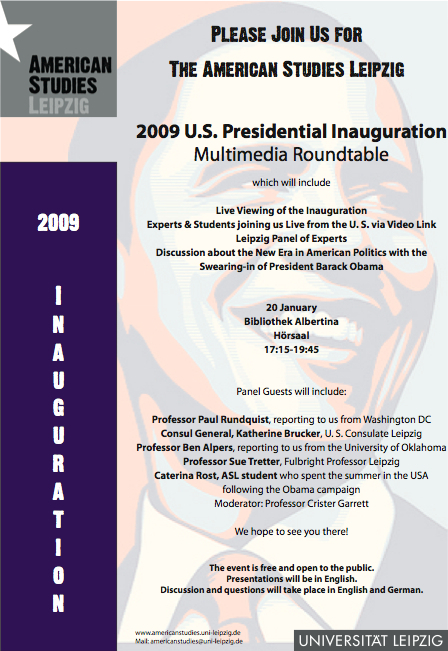 American Studies, Leipzig. 24 April 2009. The repeat exam for the LC1 lecture will take place on 7 April 2009, 10 a.m., in the Seminarbuilding S R 015. To see the final exam grades for SHP II, please check the attached pdf-file. The grades are organized by matrikel numbers.